I am getting increasingly frustrated with my Earthlink DSL service. At our old house it was very reliable but since we moved it has been up and down on a regular basis. It usually isn’t too bad, it comes up and the performance is usually pretty good. But for the last week or so, something is wrong and my patience for Earthlink is waning. 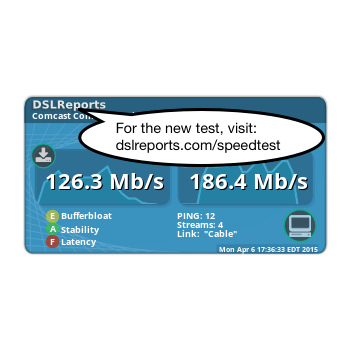 Look at this results from DSLReports.com’s Speed Test. Bleh. I need to call the cable company. A number of years ago one of my children received Eragon as a gift and we ended up reading together. I am not a big fan of Fantasy (e.g. I couldn’t get going with Lord of the Rings) but I enjoyed reading Eragon. When Eldest (the second book) came out my family gave it to me for my birthday. I didn’t think Eldest was as good as Eragon but it was still a good story. Brisingr came out a few months ago and I added my name to the waiting list at the library. I got an email a couple weeks ago that a copy was available for me so I stopped by and picked it up. I haven’t had much time to read it yet – lots of other stuff going on but I am now about 100 pages into it and the story is keeping me engaged. Since I am invested in the series, I will finish the book for sure. It has been a while since I read Eldest so I had to get reacquainted with the story and this book does a nice job of providing a summary of the first two books before the story picks up.